LM961 is a highly integrated Bluetooth v4.1 dual mode module that reduces the time to market for industrial IoT applications. The LM961 Bluetooth® Dual Mode module is a powerful, versatile and cost effective solution designed for use as a GAP Central (master) or GAP Peripheral (slave) device. This allows your embedded system to wirelessly communicate with other nearby Bluetooth® v2.0, v2.1 and Bluetooth® v4.0, v4.1 enabled devices (e.g. iOS and Android). The LM961 is also ideal for streaming high quality data and establishing Bluetooth® low energy connections. This single core standalone module combines a Bluetooth® low energy and v2.0, v2.1 radio using a dual mode Bluetooth® v4.1 stack, plus a microcontroller unit with an 8 Mbit flash memory for running the application. It also incorporates 29 pin outs, including I2C, UART and USB for interfacing with sensors and many other devices. It’s SMT side and bottom pads allow for easy manufacture and placement within your product. The LM55X allows you to evaluate the LM961 capabilities. See the LM55X Bluetooth® Dual Mode Development and Evaluation Product Family here. LM offer bespoke integration into your product by supporting your developer, including development of new applications for the module. We also offer Bluetooth® Dual Mode applications, which can be customised to your specification. The module can be used as a bridge between Bluetooth® v2.0, v2.1 and Bluetooth® v4.0, v4.1 devices, using our SPP to Serial Bridge application. We also offer SPP with GAP Central and SPP or GAP Peripheral applications. LM offers firmware development support to assist with bespoke solutions. 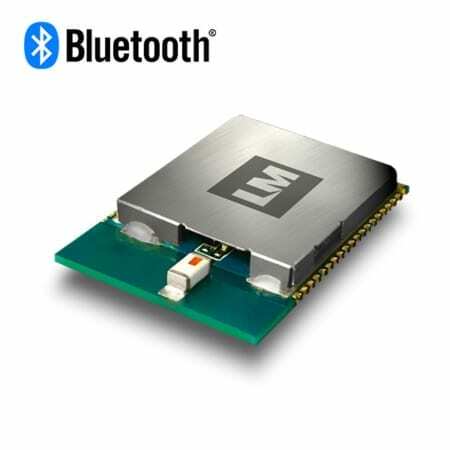 The LM961 Bluetooth® Dual Mode module comes with a range of firmware for quick deployment. Firmware can be modified to meet your unique requirements or used for evaluation purposes. SPP with GAP Central provides the flexibility of 1 SPP and up to 5 GAP Central connections simultaneously. SPP defines the setup of virtual serial ports for wirelessly connecting two Bluetooth® (v1.0 – v3.0) devices; where the LM961 is set as the master (DTE) or slave (DCE) role. An ideal solution for wirelessly replacing RS232 serial cables. LM961 is defined as a GAP Central device for initiating Bluetooth® low energy connections with nearby peripheral devices. Implemented with Over-the-Air Upgrade (OTAU) functionality for fast and convenient firmware updates. Users can read, write or modify data on the connected devices by utilising simple AT commands. It also supports a whitelist feature for Bluetooth® low energy connections. SPP or GAP Peripheral allows the LM961 to run either SPP (Serial Port Profile) via Bluetooth® (v1.0 – v3.0) or GAP Peripheral via Bluetooth® low energy. SPP defines the setup of virtual serial ports for wirelessly connecting two Bluetooth® (v1.0 – v3.0) devices; where the LM961 is set as the master (DTE) or slave (DCE) role. An ideal solution for wirelessly replacing RS232 serial cables. LM961 is defined as a GAP Peripheral device for accepting a Bluetooth® low energy connection from master devices in range. It includes Over-the-Air Upgrade (OTAU) functionality for effortless firmware updates and SPP over GATT service for serial communication through Bluetooth® low energy. SPP to Serial Bridge enables incompatible Bluetooth® (v1.0 – v3.0) and Bluetooth® low energy devices to communicate via LM961. The application is implemented on top of the CSR dual mode stack that provides the flexibility to communicate with any Bluetooth® device. A simple AT commands set is available to establish and control the two simultaneous connections that form the bridge between a Bluetooth® (v1.0 – v3.0) and a Bluetooth® low energy device. It also supports simple secure pairing for Bluetooth® connections, a whitelist feature for Bluetooth® low energy connections and SPP over GATT service for serial communication through Bluetooth® low energy. Applications are evaluated with the LM55X evaluation kit.